When Ivan started working for our predecessor firm, Horton and Haynes, in 1956 the Age of Majority in Ontario was twenty one. He had not yet reached that magical age and thus in order to sign his Articles with Graydon Horton, he had to have his father co-sign the Articles. Ivan completed his Articles in May 1960 was sworn in as an Ontario Land Surveyor. Shortly after that Graydon and Ivan co-founded Horton and Wallace, Engineers and Surveyors. From 1960 through to 1990 Ivan and his partners surveyed many thousands of properties throughout Central and Eastern Ontario. During that time period Ivan served for many years as a School Trustee and volunteered with the John Howard Society including a number of years as the National President of JHS. For his work in the community Ivan received the Apostolic Blessing of Pope John Paul II in 1982 and was awarded the Queen’s Silver Jubilee Medal in 1977. 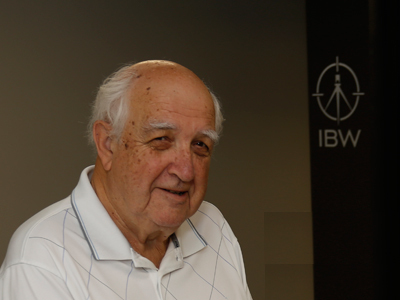 In 1990 Ivan purchased the Bowmanville office of Horton, Wallace and Davies and founded today’s firm of Ivan B Wallace, Ontario Land Surveyors or as we now refer it to as IBW Surveyors. Ivan continues to provide his time and knowledge to the IBW Team and today is now one of Ontario’s more senior active Ontario Land Surveyors.